Creating the right operational culture for your engineering team is critical to having a high performing team. More than ever building the right products and having a very fast time-to-market is what will separate winners from losers. Without a good culture, your teams will never perform well enough to keep up. We came across this culture model on a great InfoQ article about the importance of devops culture. The competing values framework suggests there are four categories of culture that all compete against eachother: Clan, Hierarchy, Adhocracy, & Market. This model also has a pre-built survey you can give to your team and has a great visualization method for the results. We liked this model because it allowed us to design the culture that was right for us and then work toward getting there by hiring people that pushed us to the values we wanted. NOTE: We altered the wording on some of the questions, particularly in the hierarchy section, that were worded (in our opinion) too negativley. Here is our modified questionaire (including a radar chart on second tab). Another thing we have done that is valuable is to create visualizations to view the department as a whole, individual teams, and individual chapters (backend, frontend, product, etc). This gives us a great pulse on the team as a whole and how we are trending in each discipline. We also have really liked the spotify squad (team) health check. Their questions really allow you to understand the health of the team and how it is trending. We then aggregate the results to see how the department is doing. 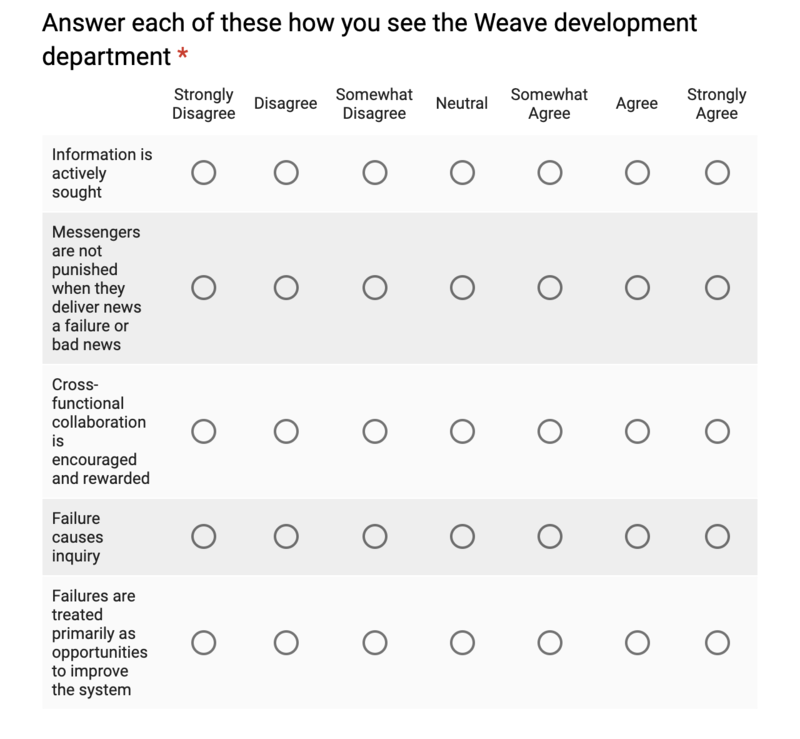 We do this survey quarterly on each team. The last method we use at Weave is the Westrum model. This model is primarily focussed on the transfer of information, and ultimately measures your psychological safety, as made popular by Google’s study on high performing teams. The study itself is old, but a good read. The study also doesn’t come with a pre-built survey you can use, but others have made surveys off of this model. We looked at a couple we liked and settled with these questions for now. If you have any question or comments, feel free to tweet at me.